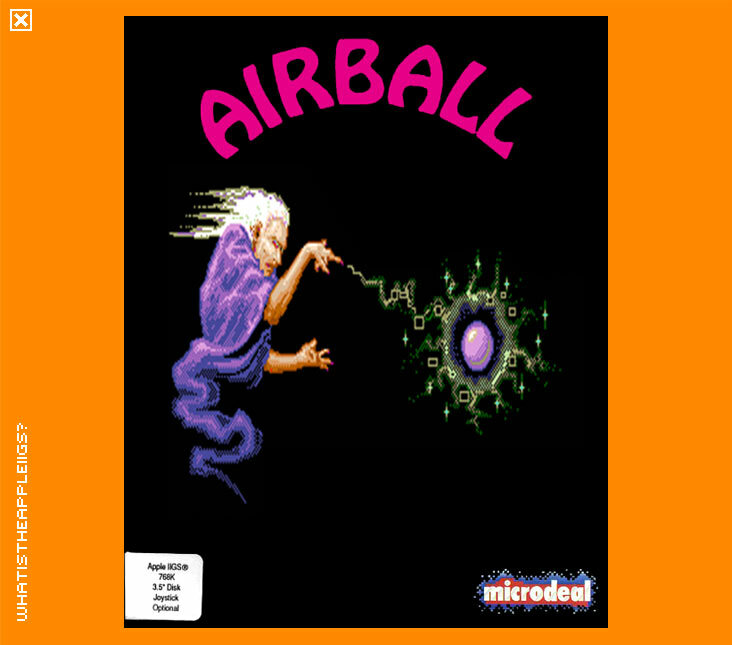 Read N Roll by Davidson for Apple IIc+, IIGS and Apple IIe, IIc - 3.5"
Airball was the one time IIGS release for MicroDeal, a company usually more associated with the Amiga. The best way to describe Airball would be to call it a cross between Bubble Ghost and Marble Madness. This time YOU are the bubble (as opposed to being a ghost and blowing it in the direction you want), which is controlled in a similar fashion to the marble in Marble Madness. Put simply, you're trapped in a castle, turned into a bubble by its resident malevolent wizard and have to find a spell book to revert to your normal human form and then get out. Control is either by keyboard (keypad, fire button, open apple and option to get or drop objects) or joystick (tab toggles between the two on the main screen). Space bar starts the game. Pop! You're dead. You start off on a pump which fills your bubble full of air, a gauge indicating how much pressure if left to keep your bubble afloat in the bottom right hand corner of the screen. Get off the pump when the gauge is parallel with your score. With your bubble as full of air as possible start to explore each room, looking for the items necessary to achieve your ends. Keep an eye on your air supply every second however, and time how long it takes to get back to the starting point from which ever room you're currently in so you can refill your bubble. Avoid sharp obstacles, solve puzzles and look in every nook and cranny. You're on your own now, so good luck!